This is a recipe using the last of the forced rhubarb from my allotment plot, the Circus Garden, harvested in a flying visit earlier today during a rare break in the rain, which over the last few weeks has caused the river Severn to burst its banks, closing significant parts of Worcester and engulfing the park directly opposite my house. On the subject of the weather, at the same time as we here in the UK have been hit by incessant rain and flooding, a large swathe of the United States has been in the grip of a big freeze, with many places recording their coldest temperatures in decades. Meanwhile, in south western Australia the record-breaking temperatures of recent weeks have been followed by severe flooding. On Valentine’s Day, Adelaide recorded its wettest February day for 40 years. The Chief Scientist at the UK’s Met Office, Dame Julia Slingo, was quoted last week as saying that whilst there was “no definitive answer” to what caused the storms here in the UK “all the evidence suggests there is a link to climate change”. If climate change is indeed responsible for these abnormal weather conditions then man-made greenhouse gas emissions are the major contributor, almost 20% of which come from the global meat industry. Anyway, here’s me banging on about the weather and for the first time in weeks it hasn’t actually rained here in Worcester today (yet), so this break in the rain has lasted much longer than expected. Is it too much to hope that the swollen river Severn will now start to recede, that the submerged park opposite my house will slowly appear, Atlantis-like, from the water and that I might finally get some “quality time” down on my allotment? It’s great on bread, toast or in scones and I have even been known to put it in a cheese sandwich. I plan to post another recipe in a few days time which uses this rather delicious jam in a slightly different take on an old British classic. Any guesses as to what it might be? 1. Pre heat the oven to 130°C (275°F, gas mark 1). 2. Place two clean jam jars apart on the middle shelf of the pre heated oven. Heat for 25 minutes then switch off the oven and leave the jars to cool in situ. When they are cool, remove the jars from the oven. 3. 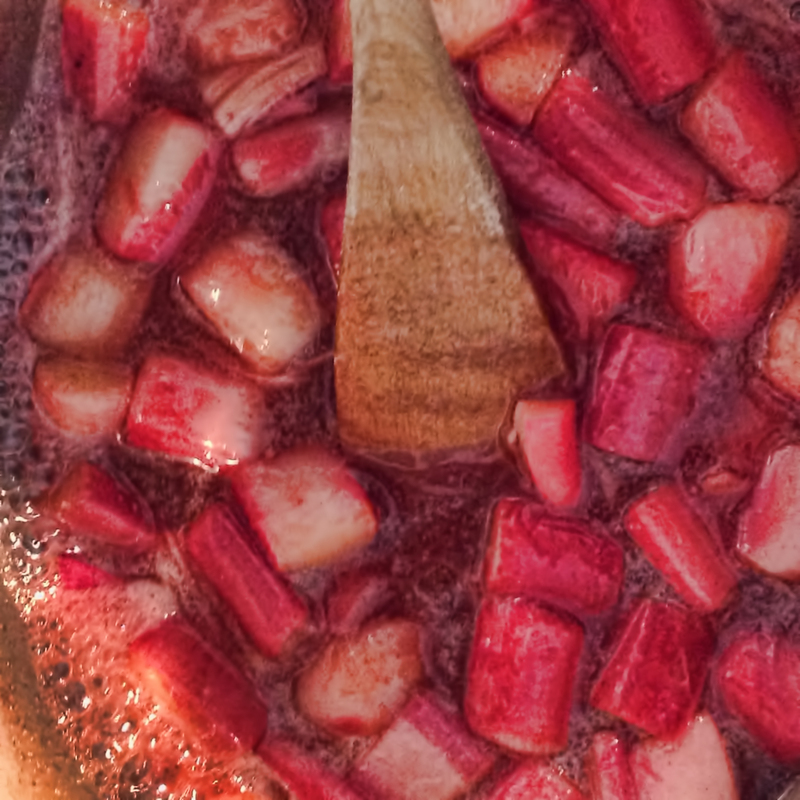 In the meantime, put the rhubarb, vanilla pods or essence, sugar and lemon juice into a large pan and stir to combine. Put the pan over a very low heat and stir until the sugar has dissolved. Increase the heat to medium and bring the mixture to the boil, then simmer for 10 minutes. Remove from the heat and set aside to cool for 15 minutes before carefully pouring the rhubarb and vanilla jam into the cooled and sterilised jars. 4. Cover the surface of the jam in each jar with waxed paper discs. Ideally these should cover the entire surface. Press these wax discs down to create a complete seal. Cover the jars with their lids. The jam will store for several months, but it almost certainly won’t last that long. Great flavors…we can’t wait to try this. I love your photo. Thank you! The flavours really do work very well together and the use of sugar with pectin ensures the jam has just the right consistency.